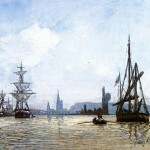 Maritime art or marine art, when it comes to paintings, features ships and the sea. 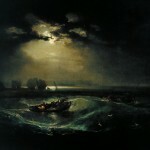 Paintings of the sea remain a popular subject but between the 17th and 19th centuries it was one of the most popular subjects among painters. The marine art genre is thought to have begun with ship portraits – paintings which depict a single vessel. Depictions of ships and the sea paintings have been found in petroglyphs dating back to 12,000 BCE. Since The Famous Artists primarily deals with drawings and paintings, the first artist (that we have profiled) thought to have produced works in this genre was Jan van Eyck. Unfortunately, both of those paintings are considered lost. Some illuminated manuscripts no doubt included scenes of the Sea of Galilee but for the most part, with a few notable exceptions, like Simon Bening, Master W with the Key, Carpaccio and Konrad Witz, examples of marine art before the 15th century are limited. Artists from the Netherlands, England, Belgium and Italy all produced marine art that ranged from staid portraits of royal ships to fantastic tempests with gigantic waves. It was not until the 16th Century that maritime art begins to truly come into its own. Led by the Dutch and their traditions of the “world landscape”, their marine art often depicted historical scenes rather than simple landscapes or sea paintings. 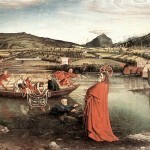 The Protestant Reformation restricted the use of religious art which turned into a great opportunity for artists to develop landscape art, history painting and in turn marine art. 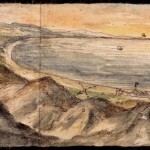 The earliest known “pure marine painting” is the Portuguese Carracks off a Rocky Coast. It was painted by an unknown Flemish “follower of Patenir” around 1540. 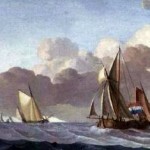 Perhaps it is a result of their fishing traditions or their strong navy, maritime painting was perhaps most prevalent among the Dutch artists. The period known as the Dutch Golden Age produced some of the world's most treasured works of art painted by many of the most famous artists who ever held a brush. It is thought Hendrick Cornelisz Vroom was the first great Dutch marine specialist but there are many wonderful marine and sea paintings that were done by Golden Age painters. 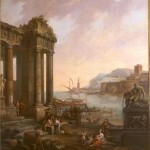 The 18th century was a period marked by numerous expeditions and military conflicts. 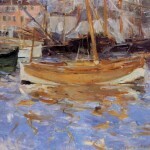 Artists had perhaps more material than ever before of a maritime nature that they could immortalize with their pigments. 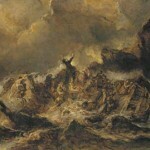 Several, like Nicholas Pocock, had been seamen who found themselves both witnessing and documenting the events they participated in, such as the battle depicted in his Glorious First of June. Naval cadets were encouraged to hone their artistic skills to document major events, sketch the new lands they visited and update their maps. 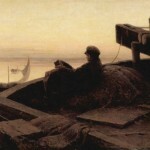 Perhaps in light of the many heated sea battles being waged during this century, more and more artists took to depicting shipwrecks; a trend that continued into the 19th century with artists like Eugene Isabey. More paintings of Venice along with its canals and gondolas were produced during this time as well. 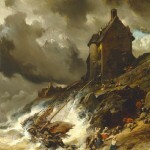 Painters of the 19th century continued the trend of painting dramatic images of storm-tossed seas and ships fighting to remain afloat. However, the Romantic period and the Danes and Germans, in particular, began putting an emphasis on tranquil waters, golden light and scenes which focused a bit more on the beauty of the sea. Paintings from this time still often captured historical events but the overall tone of the paintings included more bright colors and sources of light. The United States had only obtained its autonomy in the late 18th century and as the country began to establish itself, so did their artists begin taking their place among the best in the world. Led by a number of English and European immigrants, American landscape art and maritime painters, in particular, began to produce works that could match the high standards set by older countries and more historic centers of fine art. The Impressionists and others were observing the trend of the sea and the beaches becoming a place of pleasure rather than one of work and offered many scenes of beaches, cliffs and rivers. Ship portraits continued to be in demand but maritime art was changing from one of chronicling history to one of chronicling the romance and beauty of the world's waterways. As The Famous Artists is designed to only show works that have fallen into the public domain, we won't have much 20th century art. The martime art from that period that we will feature is limited. 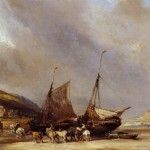 Around the end of the 19th century, the trend continues to move into marine art that focuses more on the landscape and often does not include a sailing vessel of any kind. There are still artists immortalizing famous ships and moments of history during this period, but the focus is on the waterway itself and its dual nature of tranquil beauty and furious tempests. 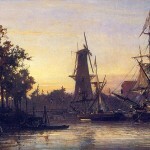 The examples of maritime art on The Famous Artists listed below are in no particular order. They are not grouped by date, artist or country but simply in the reverse order in which they have been posted. Rather than turn this section into an all things wet sort of catalog, unless the waterway included in the painting is an ocean, sea or major transportation channel, it will not be included here. Please use the search function if you are looking for paintings with ponds or lakes.